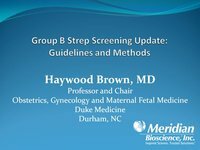 Key opinion leader, Haywood Brown, MD, Professor and Chair, Obstetrics, Gynecology and Maternal Fetal Medicine Duke Medicine, Durham, NC, presents on the topic of Group B Streptococcal disease. Group B Streptococcus continues to be the leading cause of morbidity and mortality in infants. This program will provide a comprehensive overview of this pathogen and the 2010 CDC guidelines that address diagnosis and prevention. 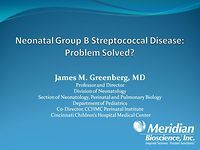 Key opinion leader, James M. Greenberg, MD Professor and Director, Division of Neonatology, Cincinnati Children's Hospital Medical Center, presents on the topic of neonatal Group B Streptococcal disease. Group B Streptococcus continues to be the leading cause of morbidity and mortality in infants. This program will provide a comprehensive overview of this pathogen and the 2010 CDC guidelines that address diagnosis and prevention. 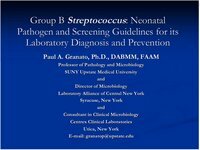 Group B Streptococcus continues to be the leading cause of morbidity and mortality in infants. This program will provide a comprehensive overview of this pathogen and the 2010 CDC guidelines that address diagnosis and prevention. Key opinion leader, Donna Mayne, B.S. 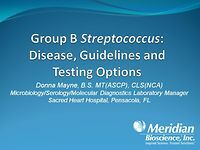 (MT) ASCP, (CLS) NCA, presents on the topic of Group B Streptococcus. She discusses disease state, guidelines for testing and testing options. Rapid EIA for the detection of C. difficile toxins A&B in stool specimens.